11 Witcher facts for 11 years of The Witcher! Every development cycle is chock-full of ideas — some good, some bad, some absolutely awesome! A lot of them you can see in the game. Others never go as far as to be included or end up unnoticed by players. Over the next 11 days, in celebration of The Witcher’s 11th anniversary, we’d like to share some of the hidden gems as well as other ideas that were present during the course of development of The Witcher series. Let’s start simple — you all know this iconic Triss outfit from The Witcher 2. At first it was our main inspiration for her look in The Witcher 3. Check out a few early concepts! Interesting! I wonder how differently the character would have been perceived with either the chaplet or headscarf. It appears as though a few elements from the second concept from the left were echoed somewhat in her Wild Hunt outfit. I love her outfit from Witcher 2, actually more than the one from the third title. Her outfit, her chest size, her red hair colour all were perfect in the third game. She also looks really cool with the hood in novigrad. I just find the outfit she's got in the second game more lore friendly for me because I always imagine Triss embarrased becauause of the chest scar when reading books. That simple. 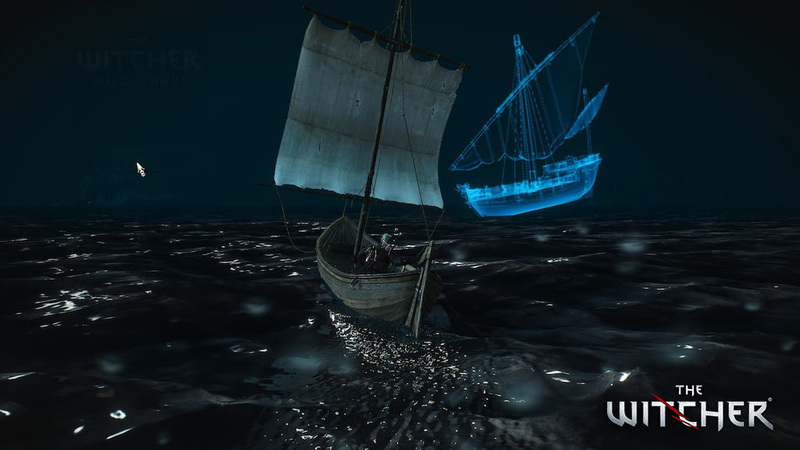 At a specific time of night and a specific location in the waters of Skellige, a ghost ship emerges only for a brief moment. This happens once each and every day. Wanna go ghost hunting? Often read of that phantom vessel. Never managed to catch it. Perhaps next time. . . .
Never even heard of that ghost ship. Definitely going to be ghost hunting time whenever I next visit Skellige! The scar was fixed sometime inbetween the books and the game, though... or so it got retconned. Persponally, I liked her outfit in W2 and 3, W1 was, well... odd. I did love her face in the trailer for W3, but not so much in the actual game. Anywho... nice facts, keep 'em comin'! Arrrgh... 'twas time for a replay anyway. This time no boat left un-explored. I guess she managed to fix it but you are never explained how, when or by who. 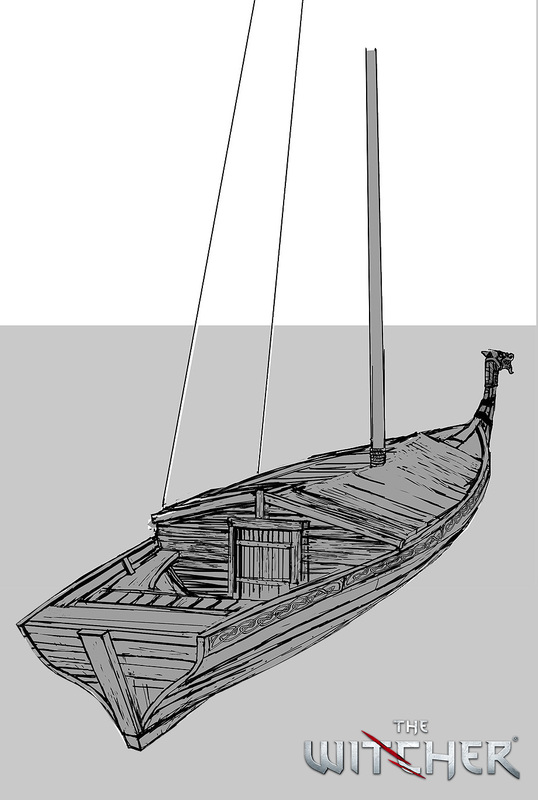 Speaking of boats — during development we were toying with an idea of allowing Roach to travel with Geralt, no matter if through land or water. Obviously, this would mean they would need a bigger boat, so here are a couple of concepts of said boat, with additional space for Roach. How do you like the idea of sailing with your trusty steed? 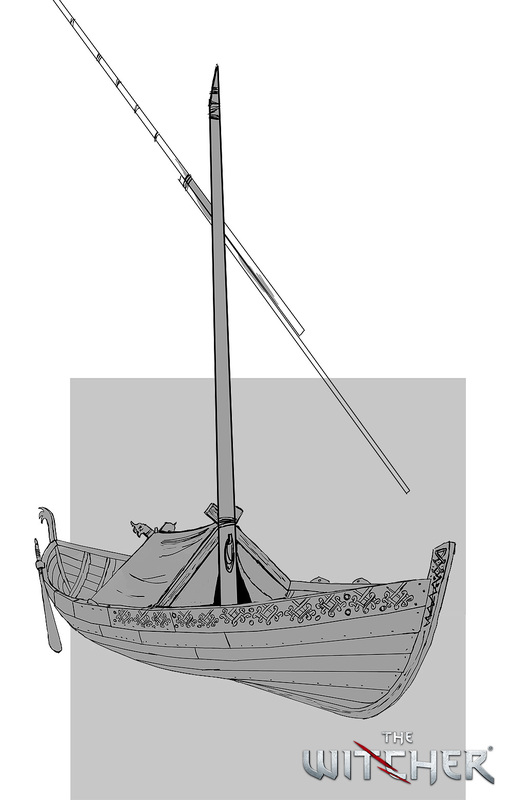 Speaking of boats — during development we were toying with an idea of allowing Roach to travel with Geralt, no matter if through land or water. Why would Roach need a boat when she has already mastered the power of teleportation? Good point... the second boat concept looks nice, though. Much more fitting to the rough waters of Skellige! Can you imagine the scenarios that would develop at sea if Roach was on a boat? Not to upstage the devs, but here are more concepts for Triss for those interested. Personally, I really liked the contrast between her hair colour and the blue and white accents in the first and second images. Looked really good. 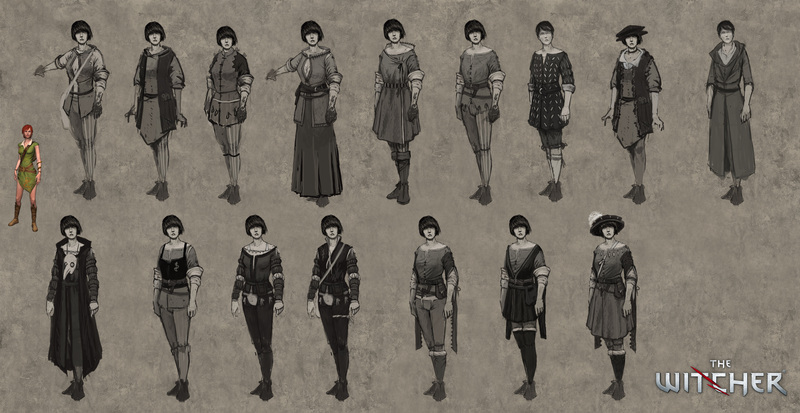 Any of these would have been cool for the alternative outfit DLC, instead of that dress Triss stole from Francesca's wardrobe. It’s comforting to see a familiar face, especially when it’s a face of a medic — at some point during the development of The Witcher 2: Assassin of Kings, we were considering Shani as part of the cast. Here are a few ideas on what she could’ve looked like! That Shani art is really cool. Shani was such a masterpiece in The Witcher 3...... Looks like the middle variant in the bottom row is the closest thing. What were the reasons that these concepts weren't taken into further development? Was it because of simplicity being easier to model for 3D modeling team? Because I personally enjoy some of these and would have liked to have them developed further, since the current end product looks very simplistic and feels as if it has something missing visually.